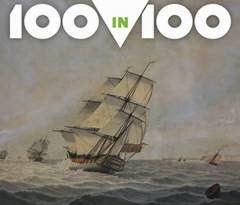 FindMyPast have added the 59th set of records in their 100 x 100 project, which set an ambitious target of 100 releases over 100 days. Today's new collection is the British Royal Navy Personnel 1831 record set which provide a snapshot of the Royal Navy during that year using ships' muster books, naval dockyard musters, hospital registers, Royal Marine shore lists and Navy lists. The records detail 66,125 men, and were extracted from ships’ muster books covering 228 vessels, hospitals, bases or musters, and a good proportion are Irish men. I've just done a quick recce and found a 30-year-old John Carty (born 1799 in Dundalk, Co Louth) who had entered the Navy two years earlier and was currently on the SS Melville stationed in Malta; and an Able Seaman Lawrence Doyle, born 1803 in Cobh, Co Cork, who had joined up in September 1827 and was currently at sea, off Jamaica, on the SS Victor. Some interesting details to be had if you can link up with one of the individuals in this set!